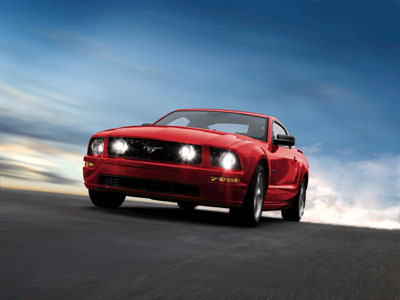 The 2008 Mustang saw the return of both, the Shelby Mustang available as a GT or a convertible with upgraded performance from the 4.6 liter V8 found in the new Mustang. And to commemorate the 40th anniversary of the new Mustang Shelby GT500KR which meant King of the Road, a very slick and outrageously powerful power plant made sure that the performance of this awesome Ford Mustang "tuner car" delivered the goods, where the marketing hype ended. How much horsepower? Stay tuned for the results in the Engine and Power train section. For the ladies, there was a special limited warriors in pink edition car, celebrating the 25th anniversary and support for Susan G. Komen for the Cure. Partial proceeds from the sales of these pink pony cars went to help raise funds for the program. As expected, exterior styling for the main models remained relatively unchanged save for the different new styling packages. The warriors in pink package includes a special pink exterior color, pink ribbon decal, pony logo and a special pony grille with fog lights. The 2008 Mustang Shelby GT received its own special Vista Blue exterior color with a silver stripe. That blue looks suspiciously like the original Shelby Cobra blue and the front end bumper treatment reminds you of the 1965 - 1967 Shelby and Eleanor front ends. Special wheels complete the effect. The legendary Shelby GT500KR has its own style and includes a special carbon fiber hood and special 40th anniversary badges. The hood design is right off the page of the original 2005 concept car, first seen in 2003, which itself is a modernized copy of the 1968 Shelby GT500. It includes retro looking turn-to-lock hood pins and SHELBY lettering across the front of the hood just like the originals. The Grabber Orange paint option continues for 2008. Thanks to the 2005 Mustang GTR, a lot of people are looking to make their own tribute cars, with the retro looking orange paint. While I'm not sure of the correct paint code for the GTR, the 07-09 Grabber Orange, seems to fit the bill. The paint code? The 2008 Grabber Orange paint code is a U3 by the data plate and the official Ford Code for the Mustang is M7178. The Ditzler PPG number is 911381. I'm not aware of a Dupont number as yet. Not content with basic superiority, Shelby had other ideas to make the new Ford Mustang platform into an exotic car crusher! 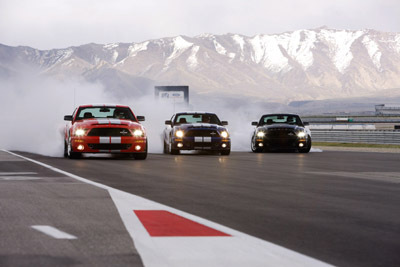 Based on the Shelby GT500, the Mustang Super Snake for 2008 raised the performance bar to 600 horsepower and beyond. Here are the details on the Mustang Super Snake. The 2008 Mustang interior for the standard packages remained relatively unchanged, save for the addition of standard side air bags on all models. A new ambient interior lighting option was made available and seemed to complement the adjustable colored instrument dial option coined "MyColor"
The Susan G. Komen warriors in pink cars received charcoal leather seats as well as charcoal floor mats with pink contrast stitching. A Leather-wrapped aluminum spoke steering wheel with Pink contrast stitching was the other main styling cue. 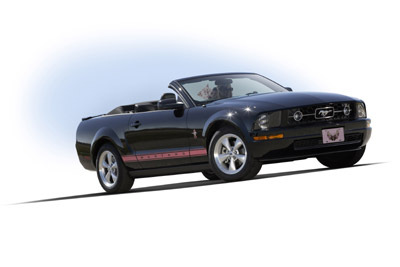 The Mustang GT California Special continued for 2008 and remained essentially identical to 2007 with its black leather seats and contrasting seat inserts. The standard 4.0 liter V6 remained the base engine choice for '08 and provides 210 horsepower. The 4.6 liter V8 in the GT cars has an unchanged 300 horsepower. Both engines are available with either a 5 speed automatic or a 5 speed standard transmission. The new Shelby Mustang GT features a reworked 4.6 motor with some additional go fast Ford Racing parts to bump it up to 319 horsepower. The crazy fun Mustang Shelby GT500KR king of the road features a supercharged version of the 5.4 liter engine with 540 horsepower on tap, coupled to a short throw shifter and a 3.73:1 rear end.